Vessels swept some oil into a fire-resistant boom for a "test burn"
The US Coast Guard says five times as much oil as previously thought could be leaking from a well beneath where a rig sank in the Gulf of Mexico last week. Rear Admiral Mary Landry said 5,000 barrels (210,000 gallons) a day were now thought to be gushing into the sea 50 miles (80km) off Louisiana's coast. A third leak had also been discovered at the site, Adm Landry said. One fire-fighting expert told the BBC the disaster might become the "biggest oil spill in the world". "Probably the only thing comparable to this is the Kuwait fires [following the Gulf War in 1991]," Mike Miller, head of Canadian oil well fire-fighting company Safety Boss, told BBC World Service. "The Exxon Valdez [tanker disaster off Alaska in 1989] is going to pale [into insignificance] in comparison to this as it goes on." If US Coast Guard estimates are correct, the slick could match the 11m gallons spilt from the Exxon Valdez within less than two months. Earlier, a coast guard crew set fire to part of the oil slick, in an attempt to save environmentally fragile wetlands. The "controlled burn" of surface oil took place in an area about 30 miles (50km) east of the Mississippi river delta, officials said. But Mike Miller warned that burning off leaking oil was not a long-term solution at all. "The object of this game is to shut off the flow," he said. Engineers are believed to be working on a dome-like device to cover oil rising to the surface and pump it to container vessels but it may be weeks before this is in place. Despite efforts to burn off the oil, the crews here are now battling against the odds. The US Coast Guard's discovery of another leak spewing oil from the collapsed rig has many here bracing for an environmental disaster on a huge scale. An estimated 5,000 barrels of oil a day are now pouring into the Gulf of Mexico and forecasters say a new weather front could push the slick towards this coastline at an even faster rate. The state of Louisiana is now asking for emergency assistance as the oil slick draws closer. It now seems inevitable that Louisiana's coastline will be hit and at least another two states could be affected. Weather forecasters have meanwhile warned that changing winds could drive the oil slick ashore by Friday night. Adm Landry said experts from the National Oceanic Atmospheric Administration (NOAA) had increased their estimate for the leak based on aerial surveys, applying dispersants, studying the trajectory of the slick, local weather conditions, and other factors. "This is not an exact science when we estimate the amount of oil. However, the NOAA is telling me now they'd prefer we use at least 5,000 barrels a day," she told reporters in New Orleans. Adm Landry also said she had been told of "a new location of an additional breach in the riser of the deep underwater well", about 5,000ft (1,525m) under the surface. 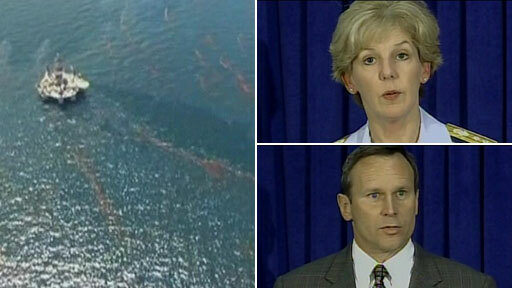 President Barack Obama had been briefed on the new developments, and the government had offered to have the defence department help contain the spill, she added. Louisiana Governor Bobby Jindal has requested emergency assistance from the federal government. "Our top priority is to protect our citizens and the environment. These resources are critical to mitigating the impact of the oil spill on our coast," he said in a statement. 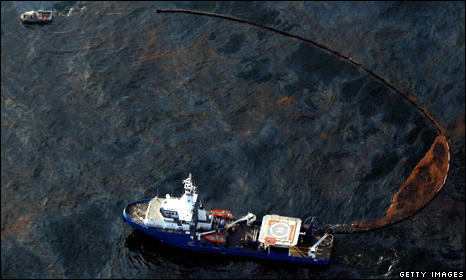 The oil slick currently has a circumference of about 600 miles (970km) and covers about 28,600 sq miles (74,100 sq km). Its leading edge is now only 20 miles (32km) east of the mouth of the Mississippi. The first of the leaks causing it were found on Saturday, four days after the Deepwater Horizon platform, to which the pipe was attached, exploded and sank. Eleven workers are missing and presumed dead after the worst oil rig disaster in almost a decade. On Tuesday Adm Landry, who is in charge of the clean-up effort, warned that work on sealing the leaking well using robotic submersibles might take months, and that the coast guard would attempt to set light to much of the oil. With the spill moving towards Louisiana's coast, which contains some 40% of the nation's wetlands and spawning grounds for countless fish and birds, she said a "controlled burn" of oil contained by special booms could limit the impact. On Wednesday afternoon, two vessels dispatched by the coast guard and the British oil company BP - which had hired the sunken rig - swept the thickest concentrations of oil into a fire-resistant boom. They then towed it to a five-mile "burn zone" set up inside the slick, where it was set alight shortly before nightfall and allowed to burn. BP says it has not been able to activate a device known as a blow-out preventer, designed to stop oil flow in an emergency. People can prevent a number of environmental disasters. The idea of placing a dome directly over the leaks has only been done in shallow water before and is still two to four weeks from being operational.